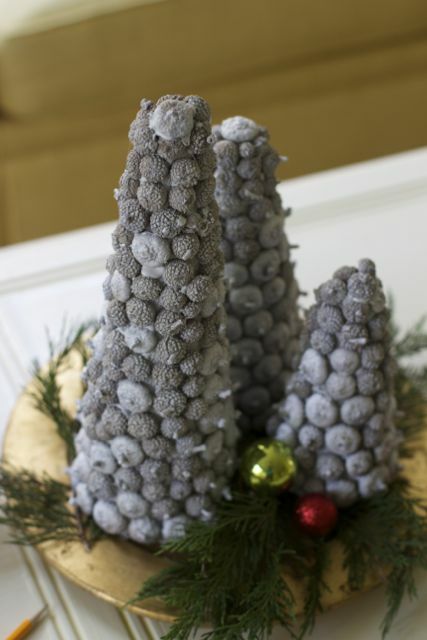 Before the snow falls, go out and gather acorn tops to make some inexpensive holiday decorations. 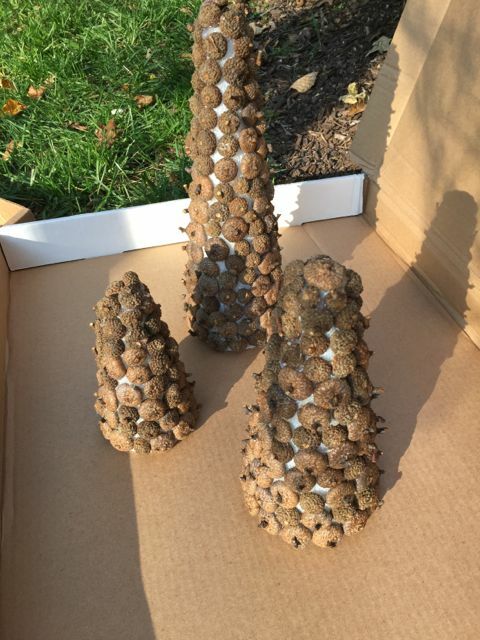 This year our yard was filled with acorns, I guess we are preparing for a cold winter. BOO. Anyway, I solicited some young neighbors to go on an acorn hunt and gather a bunch of acorn tops. 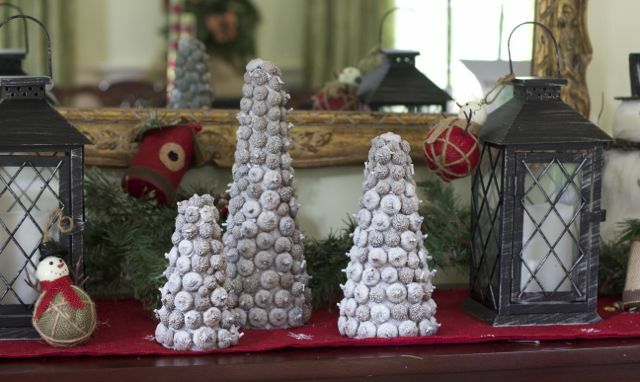 With just some hot glue and styrofoam trees, we can make these acorn Christmas tree decorations. 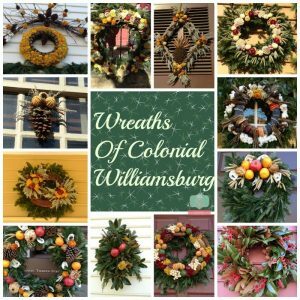 We did not have to preserve the acorn tops like we did for fall projects that require the entire acorn. 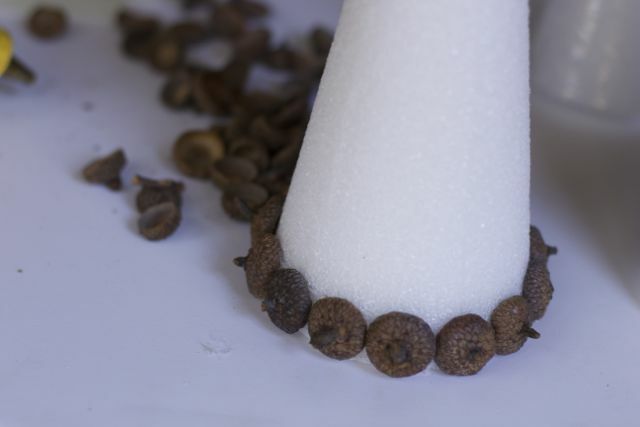 Just simply glue on the tops as close to one another as possible. Had I spray painted the cones brown first, I could have used them for Thanksgiving but we will move on as it’s too late now! 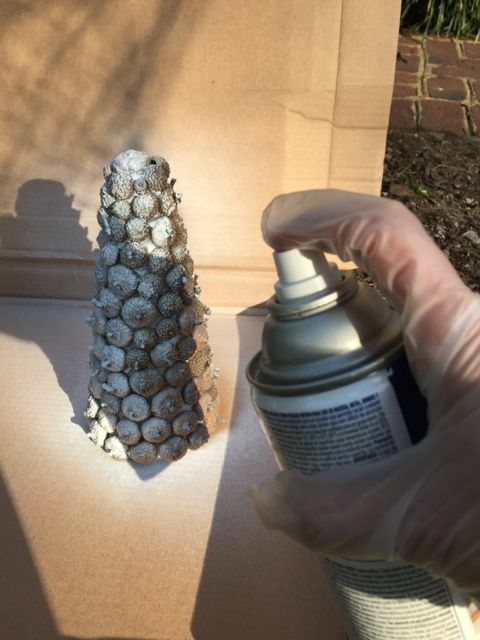 Now that they are complete pull out some white spray paint and cover the trees lightly. I liked a little brown showing. This might look nice in silver also! 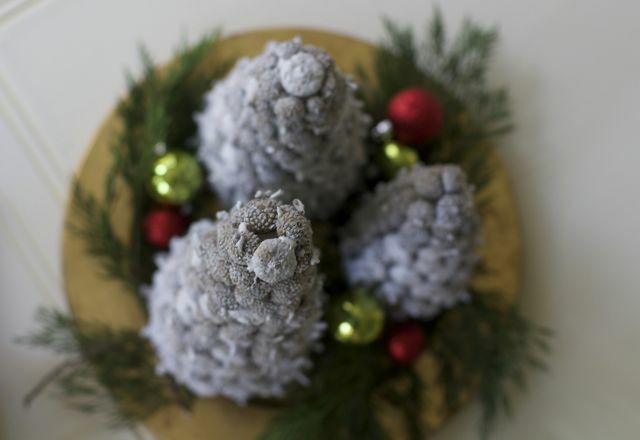 Once they are dried, you can choose to put them in your holiday decor wherever you see fit. 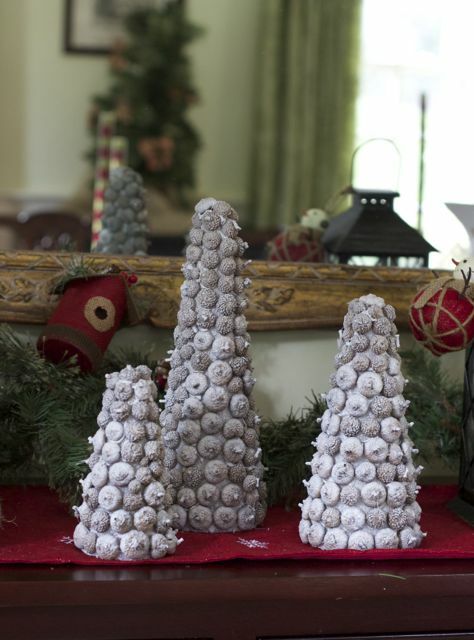 First, we placed them in our Woodland Inspired Dining Room . I liked it but realized I would probably need that space on my side board for serving food. My second thought was placing them on a coffee table on top of a decorative charger. 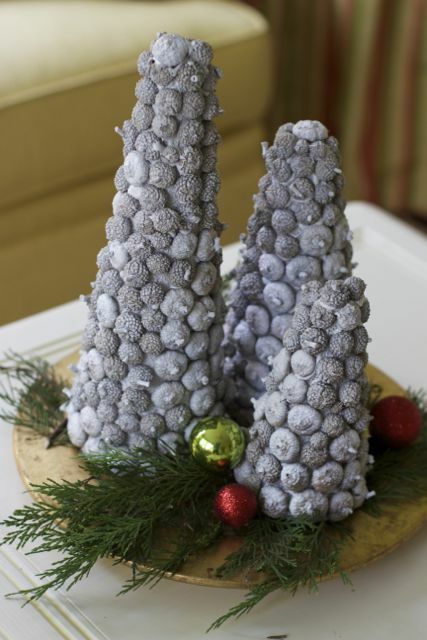 Add some greenery and Christmas Bulbs to allow the Acorn Christmas Trees to pop. Thought this was a fun view from above too. 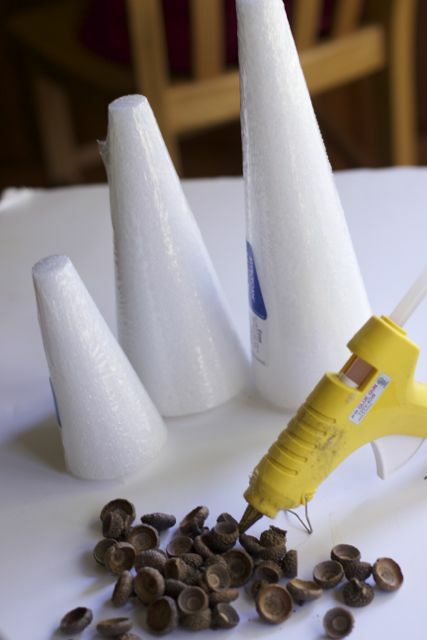 Hope you find a great place to put your DIY Acorn Christmas Tree Decorations. 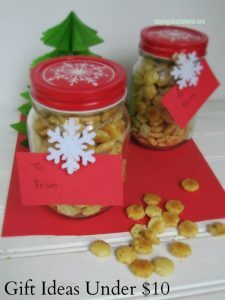 I have been on a big DIY kick lately and this one is so up my alley! Now I just have to see if I can find some acorns. That looks really cute. 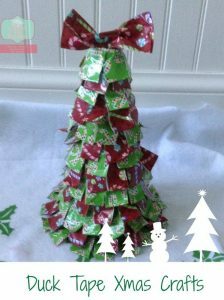 I remember doing crafts similar with my boys when they were young, it was fun.